Forget boring spinach salads! With over 25 ways to cook spinach for breakfast, lunch and dinner, enjoy a new spinach-packed meal every single day of the week. 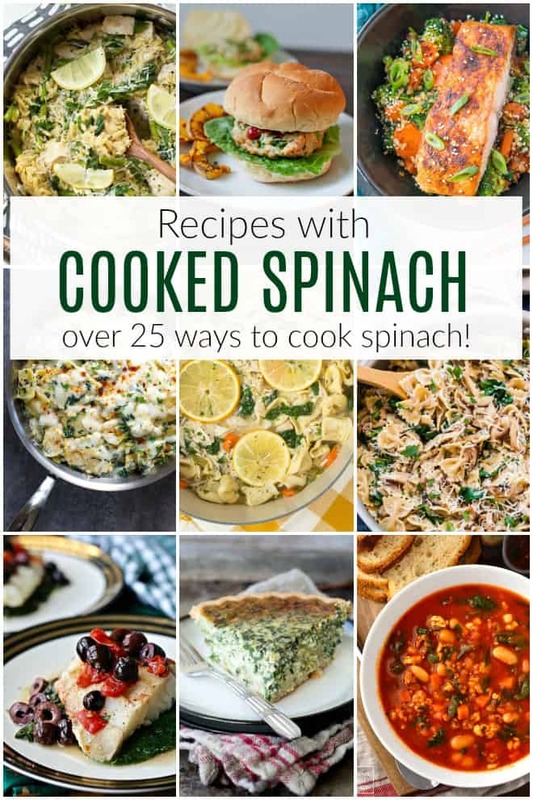 These cooked spinach recipes include chicken and spinach recipes, pasta and spinach recipes, soup with spinach recipes and more! 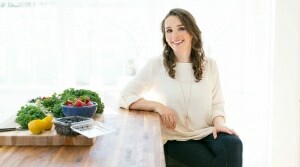 Are you looking for more ways to incorporate nutrient-rich spinach into every single meal? Spinach cooks quickly and easily to it’s a great addition to skillet meals, soup recipes and more. 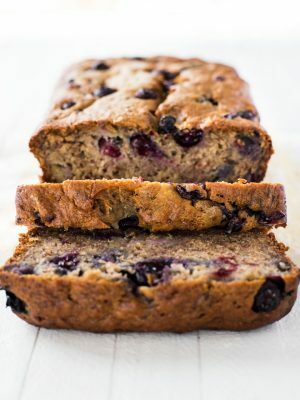 All of these recipes include tasty ways to add more spinach to breakfast, lunch and dinner. 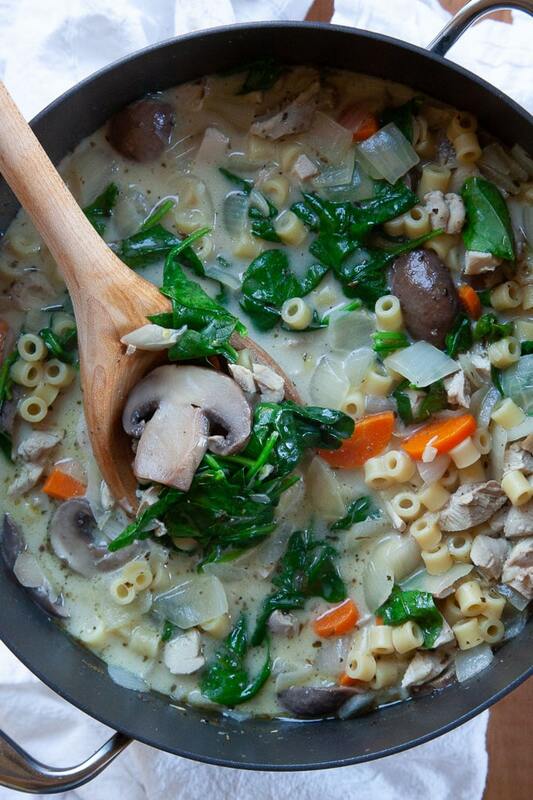 Sneak cooked spinach into creamy pasta or comforting chicken noodle soup. 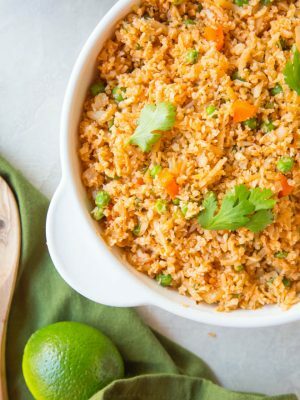 Most of these recipes cook in less than 30 minutes and please the entire family. If you’re looking for ways to eat more greens daily, including spinach, kale and other greens, check out our favorite easy skillet dinners with greens! Spinach cooks quickly. You only need to cook it for a few minutes. Add a handful or two of fresh spinach during the last few minutes of cooking. The flavor of spinach is subtle so it won’t change the flavor of your dish. Flavors like lemon, garlic, ginger, soy sauce, cheese and proteins like shrimp, chicken, bacon, quinoa and chickpeas all taste great with spinach. Sauté, boil, steam, bake or grill spinach with some of your other favorite flavors. 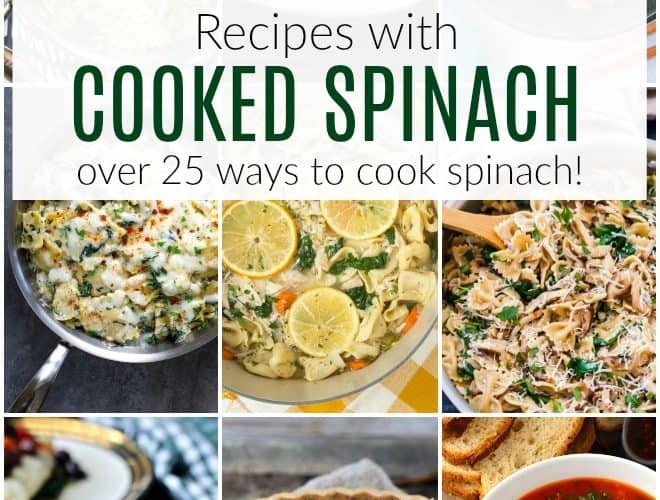 If you try one of these cooked spinach recipes, tag @spoonfulflavor on Instagram and use the hashtag #EatGreensDaily! 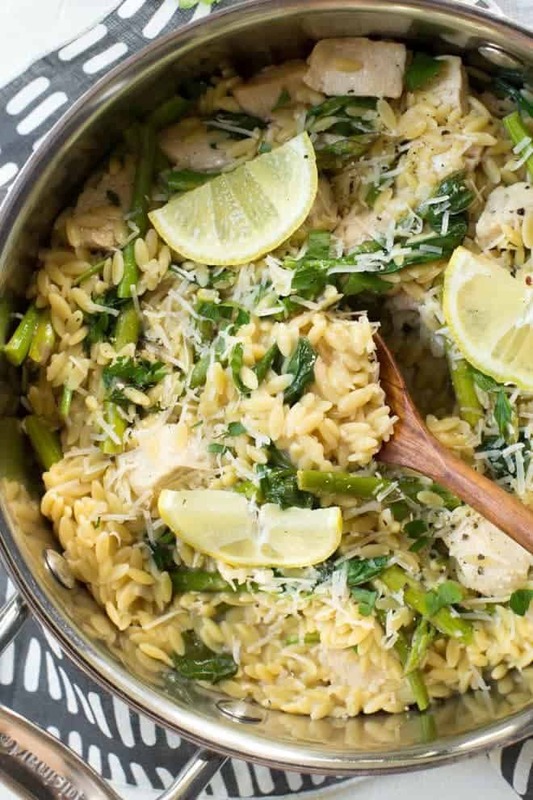 One Pot Lemon Chicken Spinach and Orzo Pasta combines the freshest flavors of the season, including lemon, asparagus, Parmesan cheese and spinach. It tastes even better as leftovers too! Roasted Red Pepper Pasta with goat cheese, mushrooms and spinach is a gluten free vegetarian pasta made with a creamy homemade roasted red pepper sauce! 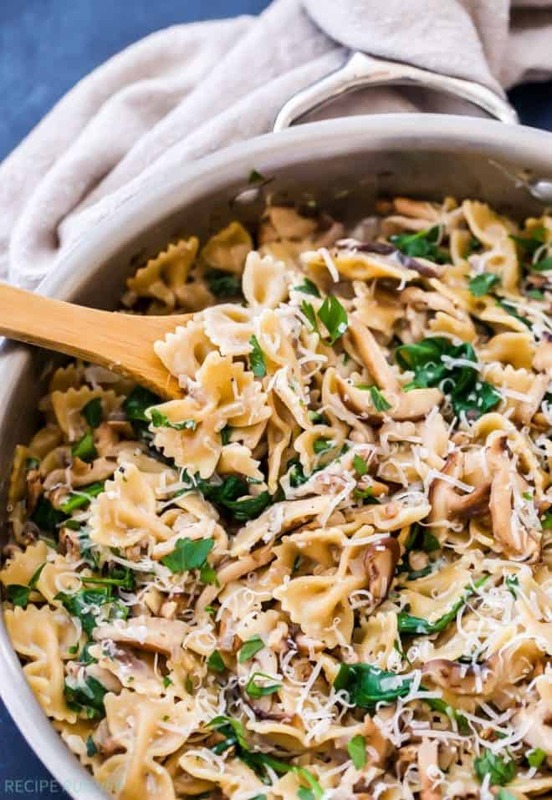 Creamy Mushroom and Spinach Pasta is an easy vegetarian dish packed with flavor. 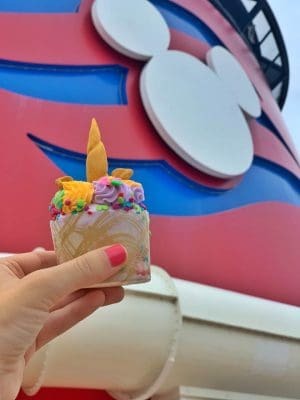 It’s so creamy, you won’t even believe there isn’t actually any cream in it! 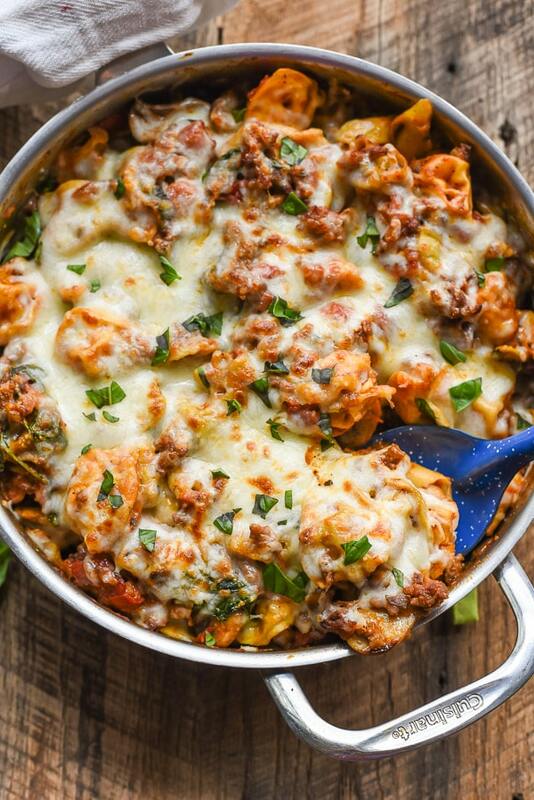 Cheesy One Pot Tortellini and Sausage is the perfect comfort food made in less than 30 minutes! 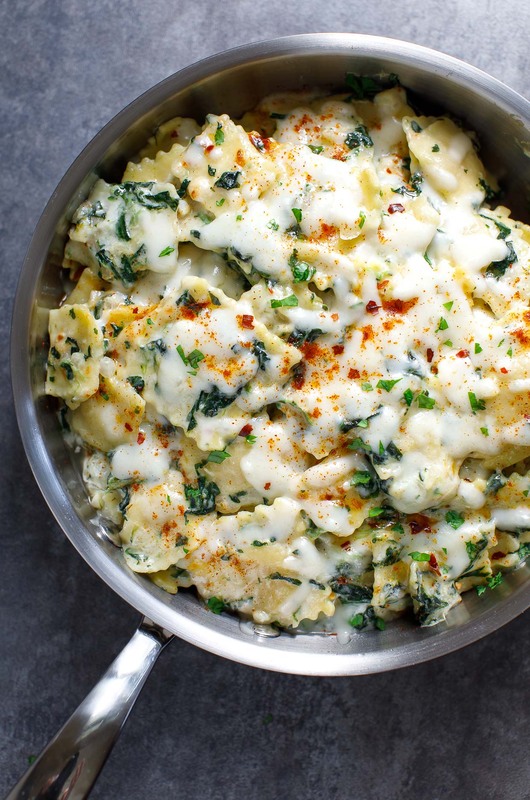 Creamy Spinach and Cheese Ravioli will impress even the pickiest eaters. A dish that combines homemade garlic Alfredo sauce and cheesy goodness creates a comforting meal for the entire family. 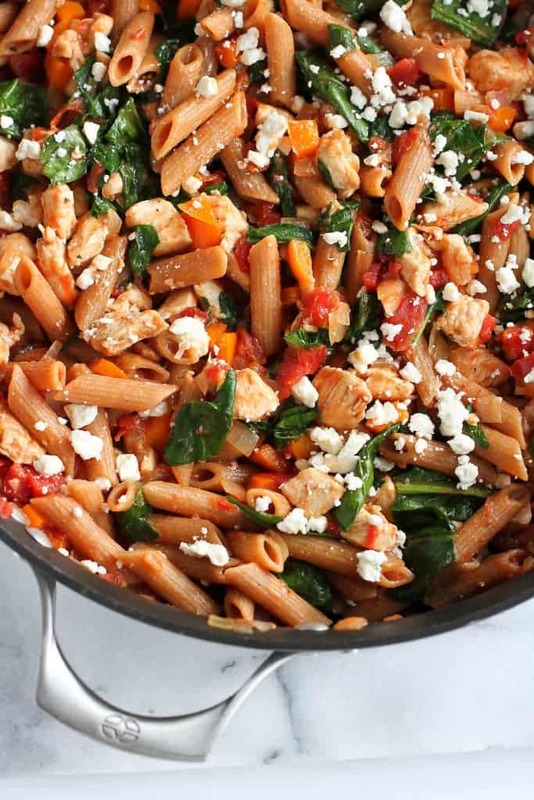 One-pot pasta with chicken and spinach is the way to go on busy weeknights. 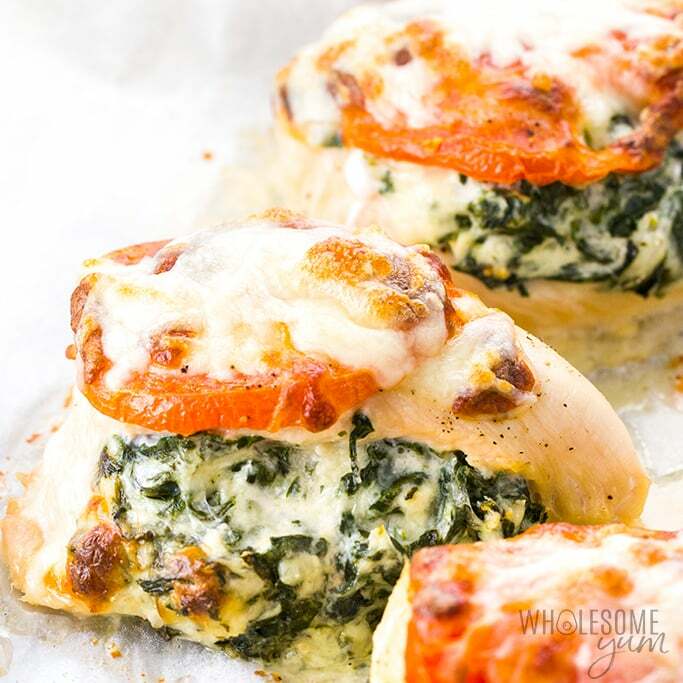 Filled with chicken and spinach, this healthy dinner is always popular! 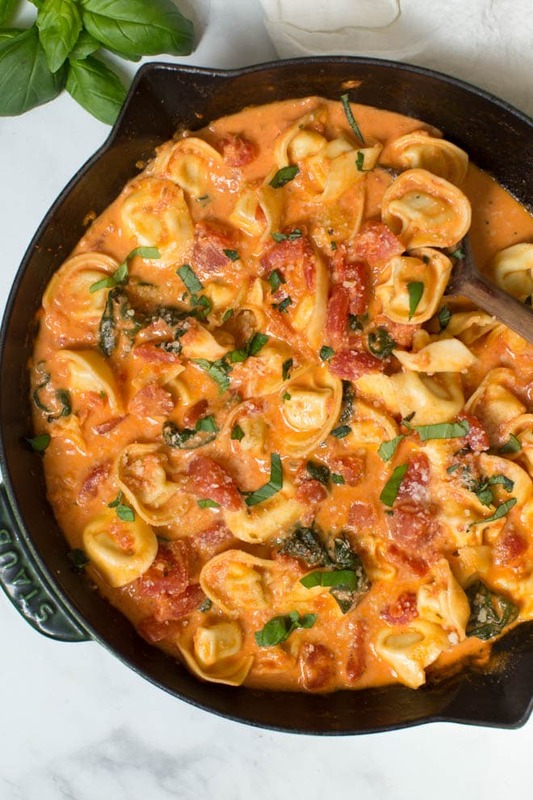 Creamy Tomato Basil Tortellini Skillet cooks in less than 30 minutes and is perfect for the entire family! Use spinach tortellini to add even more spinach. 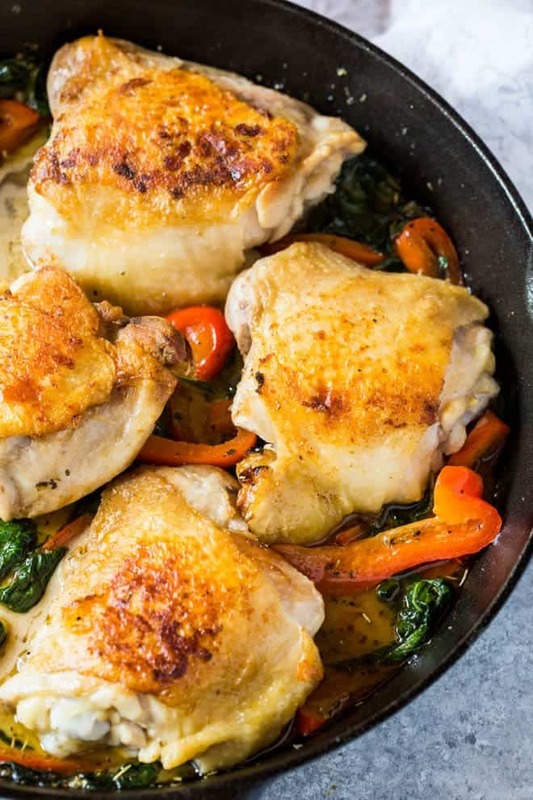 Creamy Chicken Skillet with Red Pepper and Greens is a simple one skillet meal in under 30 minutes! 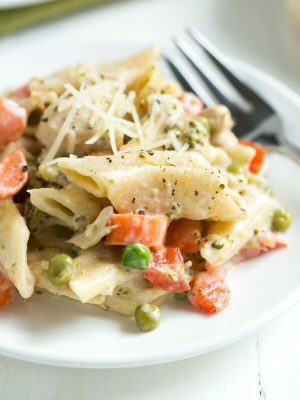 The creamy garlic basil sauce and fresh vegetables with the chicken creates a flavorful meal for everyone. Cheese and spinach stuffed chicken breasts takes just 30 minutes! 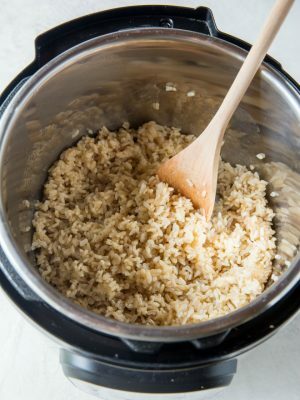 Combine a few common ingredients to create a low carb gluten free meal. 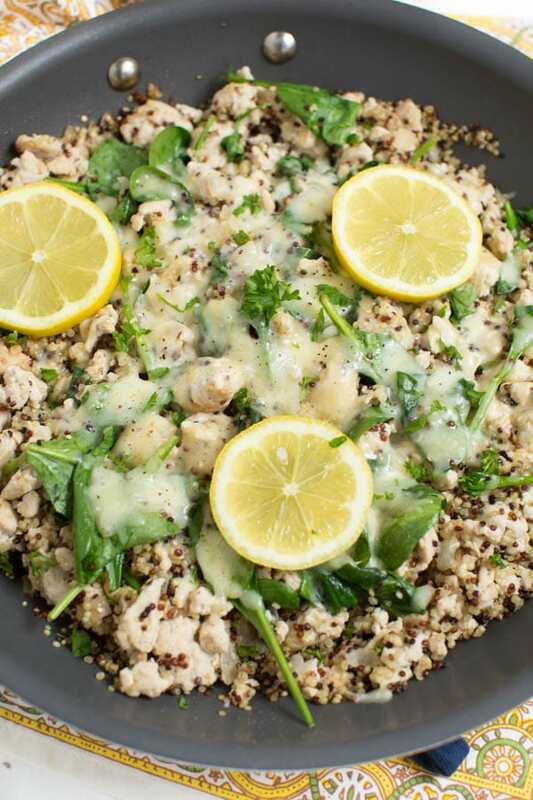 Lemon Chicken Quinoa Skillet with baby spinach is a protein packed meal that is great for meal prep! 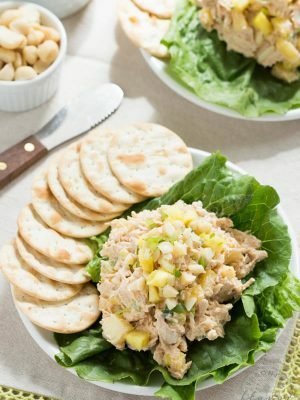 The recipe uses fresh lemon and a few other simple ingredients to create a protein packed meal. 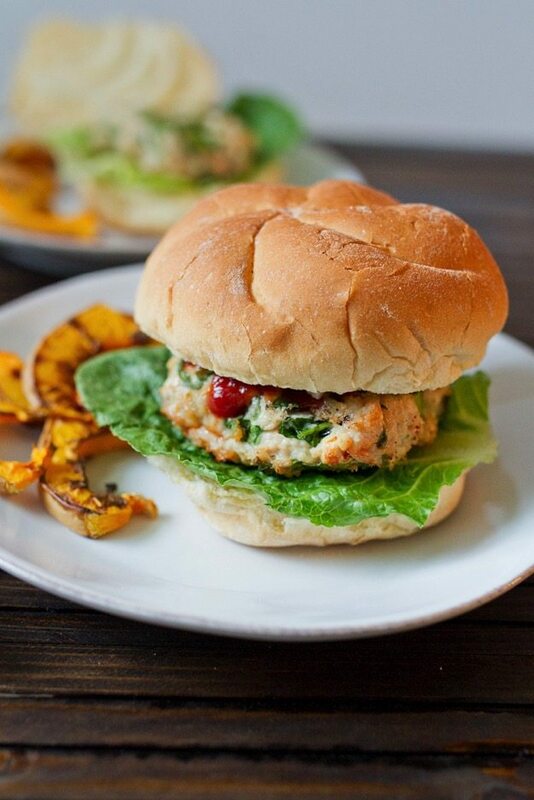 Spinach and feta turkey burgers uses ground turkey switch it out for ground chicken, if desired. Either way, the result is a great tasting burger with fresh flavors, lean meat and spinach! 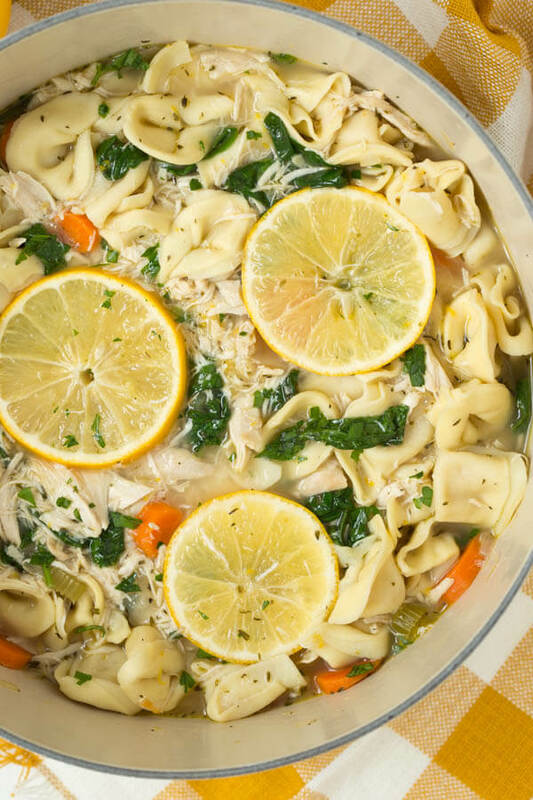 One Pot Lemon Chicken Tortellini Soup with Greens combines chicken, pasta, spinach and fresh lemon flavor with a few other simple ingredients. 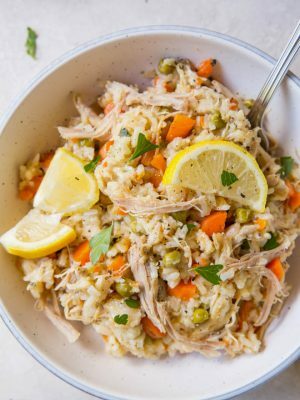 It’s a fun twist on classic chicken noodle soup that the entire family will love. 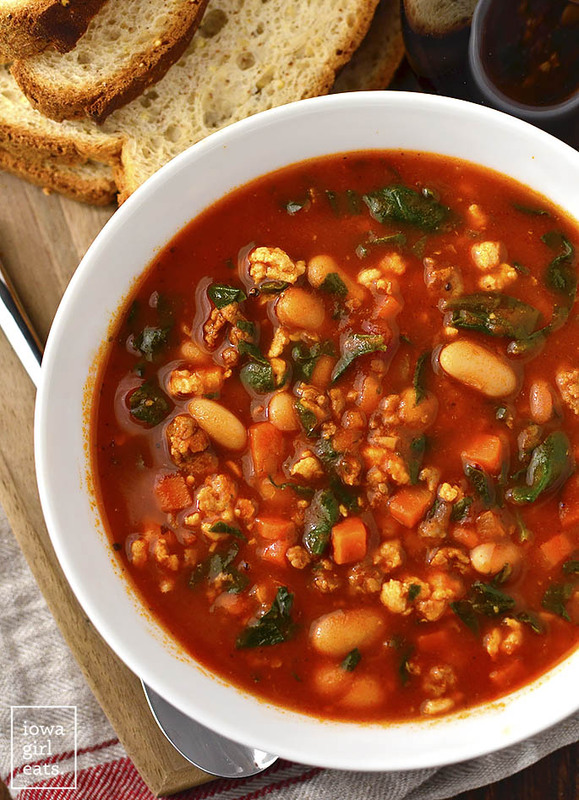 Italian Sausage, Spinach and Tomato Soup is a gluten-free soup recipe full of healthy, hearty ingredients. 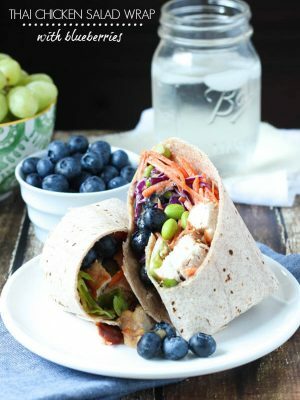 Just 30 minutes from fridge to table! Chicken Florentine Soup is inspired by the classic chicken dish by incorporating spinach, onions, mushrooms and carrots in a white wine creamy broth. 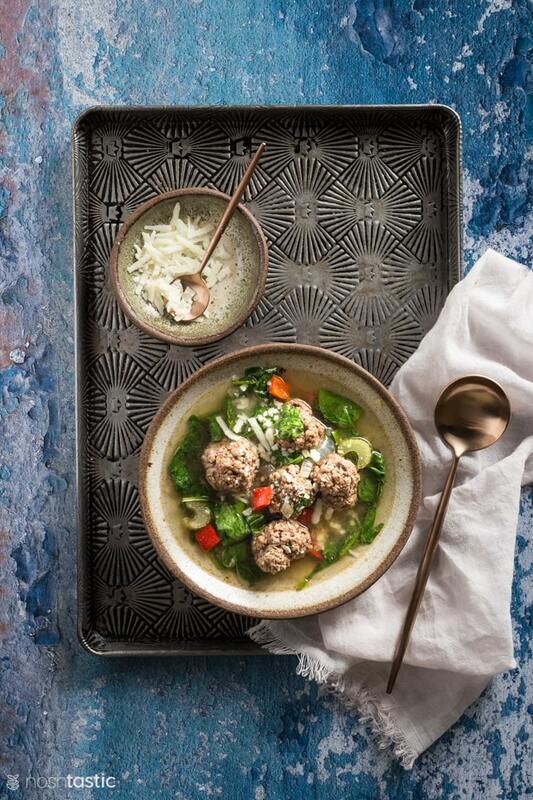 Italian Wedding Soup combines a variety of fresh flavors with fresh spinach to create a wholesome meal packed with fresh flavor! 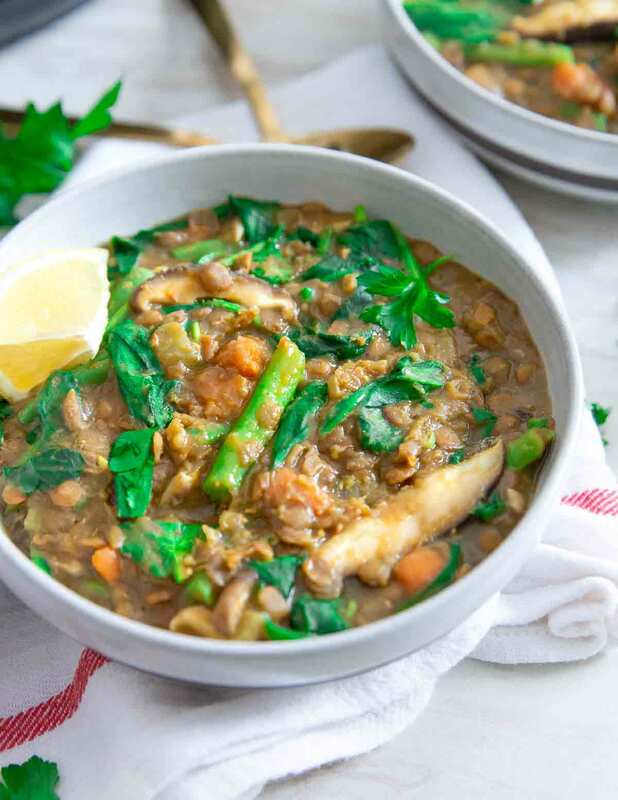 Lentil vegetable soup is packed with mushrooms, green beans and spinach, made entirely in the Instant Pot for a quick and easy comforting vegetarian meal full of flavor. Spinach Lasagna Soup is your favorite comfort food served in a bowl and topped with cheesy goodness. 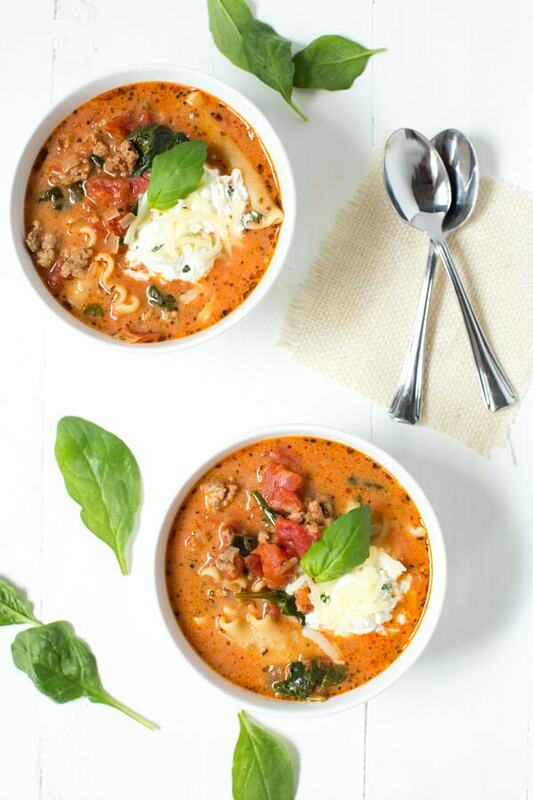 Made with fresh spinach, tomatoes, Italian sausage, lasagna, herbs and more, this soup is perfect for the entire family! Summer Vegetable Frittata isn’t just for summer. Pack this frittata with fresh greens for a well-rounded breakfast or brunch option. Substitute the summer squash for spring, fall or winter vegetables to create a year-round meal. 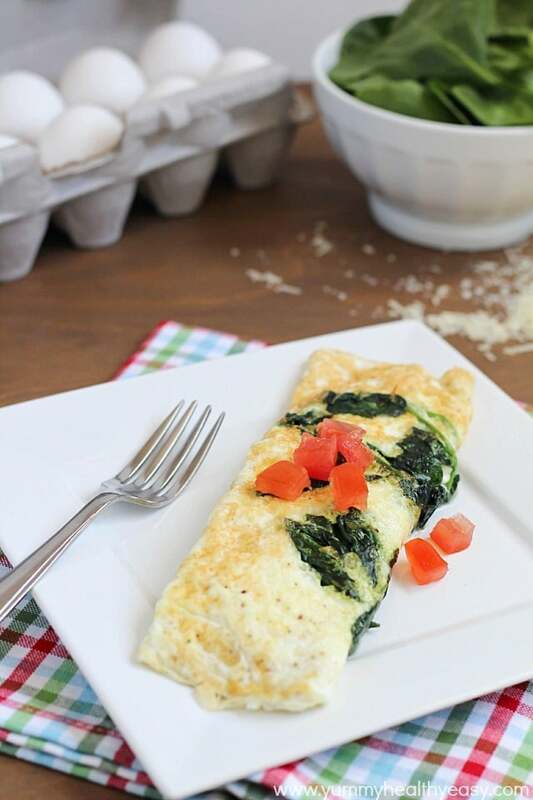 Easy Spinach & Egg White Omelette is a delicious and super easy clean eating omelette that makes the perfect healthy breakfast! Enjoy a hearty breakfast in less than 15 minutes. 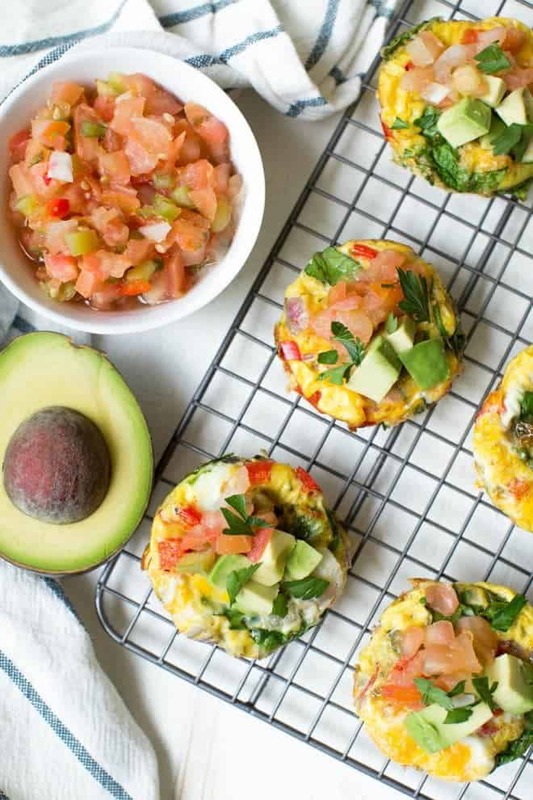 Southwest Egg Muffin Cups are made with a few fresh ingredients and bake in the oven in less than 30 minutes! Add these to your weekly meal prep routine and enjoy them for an on-the-go snack or easy breakfast. 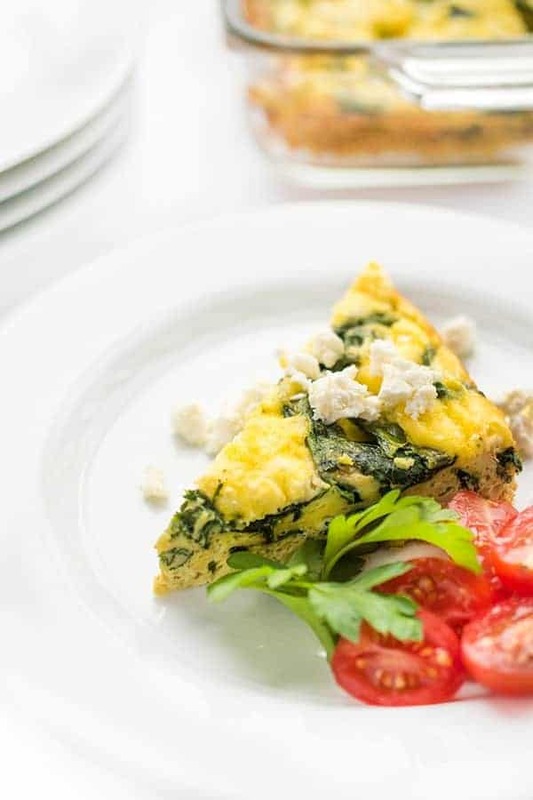 Spinach and Feta Greek Egg Bake is a great choice for breakfast, lunch or dinner. This low carb, high protein meal is a great addition to brunch and tastes great as leftovers. 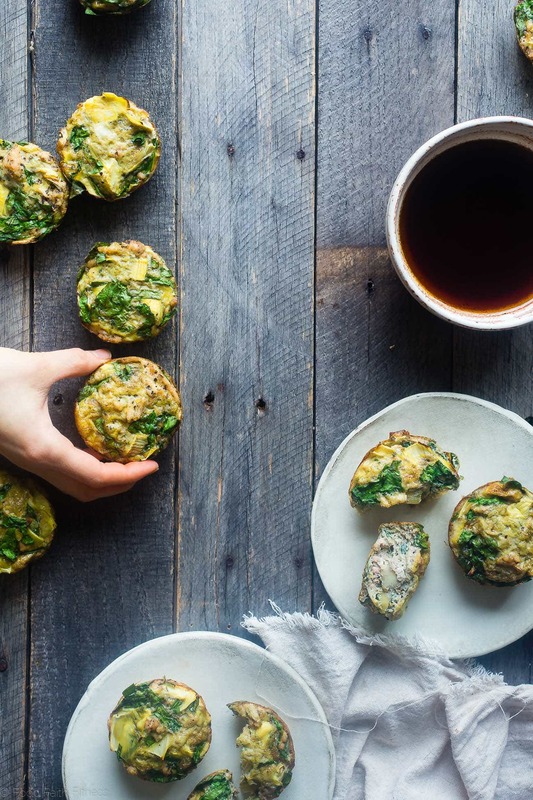 Spinach breakfast egg muffins are low carb, gluten free, whole30 compliant and under 100 calories! Perfect for busy mornings! 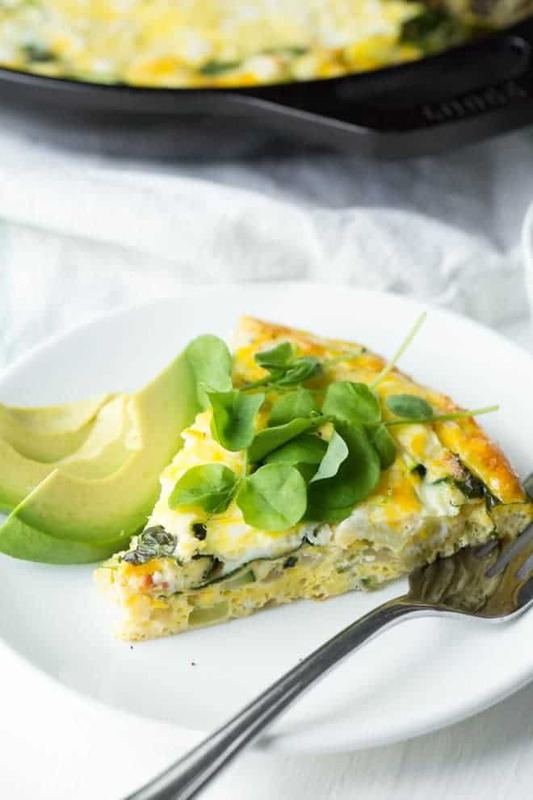 Spinach and artichoke quiche is a simple recipe that is perfect for breakfast, brunch or dinner. It’s a great way to pack in a lot of spinach! 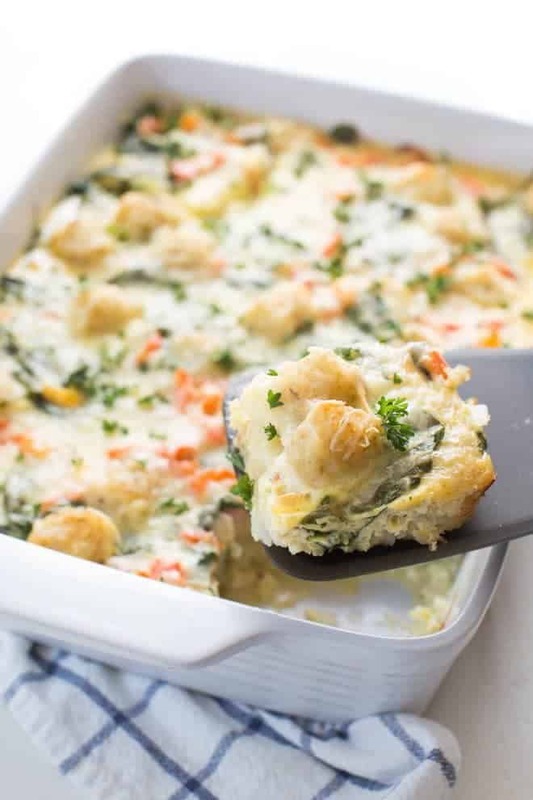 Tater Tot Breakfast Casserole with veggies is an easy breakfast recipe that comes together with a few ingredients! Make it ahead and bake it just prior to serving. 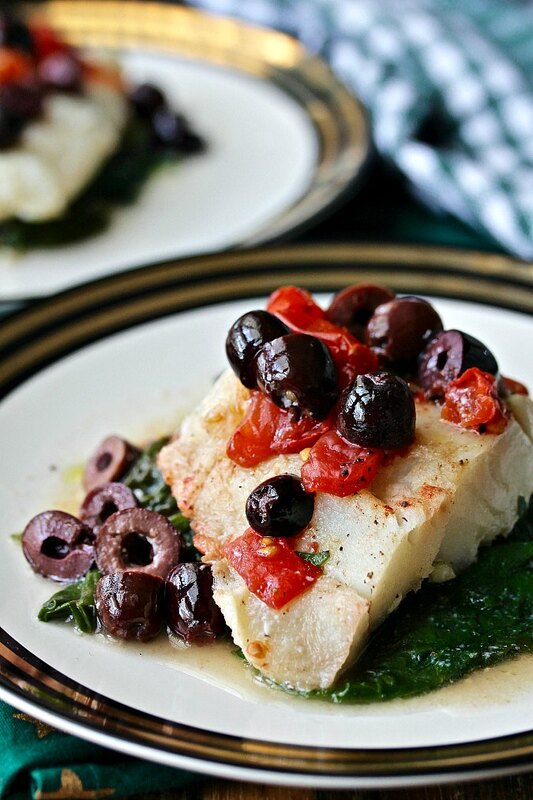 Cod with Spinach, Tomatoes and Olives cooks in less than 30 minutes for a complete nutritious meal! 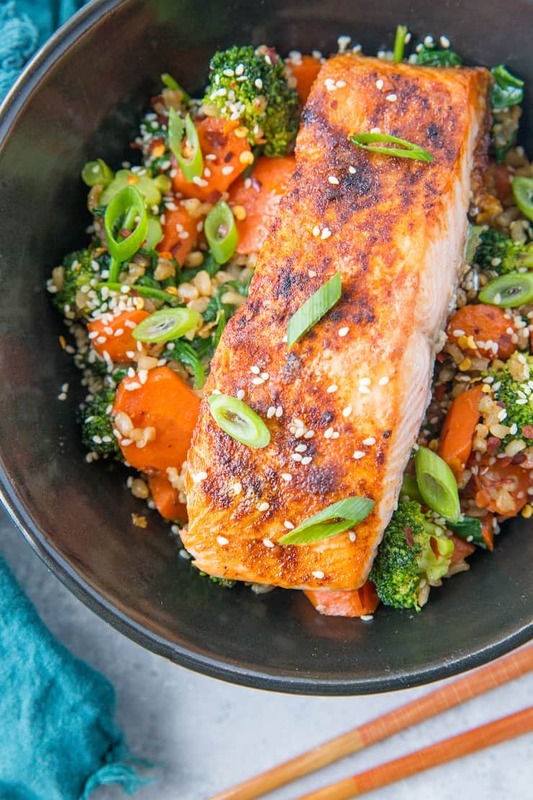 Crispy Paprika Salmon Bowls combine fresh veggies like broccoli, carrots and spinach. This well-balanced meal is also quick and easy to prepare.